If you want to block users accessing certain websites in your office or home, D-Link router can help you. 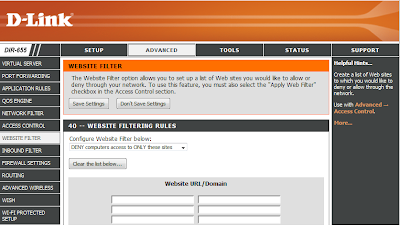 D-Link router has website filter which can deny access to specified websites from all computers connected to it. This website filter feature of D-Link can help you prevent your kids in home or staffs in office from accessing unwanted or dangerous websites. The unwanted list includes adult websites, Social network sites like Facebook or Twitter, Chat websites or even Google. Login to D-Link Router by using the IP address 192.168.0.1 and use admin as the username and leave the password field blank. Click Advanced tab on the top of the page and click website filter. Make sure you have selected the option DENY computers access ONLY these sites. Type the website domain address and the name on the specific fields. For example, if you want to stop employees at your office to use Facebook, you simply add the Facebook address here. After saving the list, it will not allow anyone in your office to access Facebook. Do not forget to click on Save Settings button after adding the names and URLs of websites you want to block using D-Link router. Blocking social media sites and online chat in a company is always a herculean task for managers because it can reduce the efficiency of office staffs at work. For those office managers who want to stop staffs spending work time in social media sites, D-Link router is a great help. Also, parents who want to prevent their kids from browsing unwanted websites too can feel safe after enabling website filter on D-Link router. If you want to set different permissions to access websites for different computers in your LAN, you must enable Access Control and set new policy. That I will explain later.